Over the last few months we’ve had the privilege of deploy numerous creative Power BI embedded solutions into custom apps for clients. 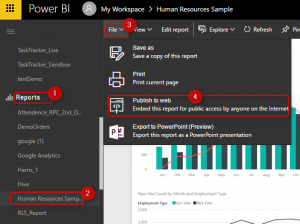 It is a service which allows users to access Power BI cloud based reports with out need for signing into the powerbi.com service to access the reports within that environment. Here you can easily bring your report into the iframe of your application. You embed the report using the link generated by “publish to web” feature. 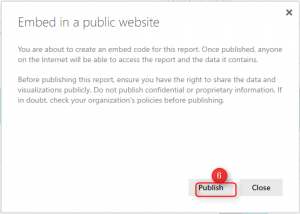 This simple method uses a public report URL. This approach doesn’t allow for viewing reports based on user’s permissions, neither to manage page/report level filters. Be aware, when you use Publish to Web, the report or visual you publish can be viewed by anyone on the Internet. There is no authentication used when viewing these reports. Only use Publish to Web with reports and data that the anyone on the Internet (unauthenticated members of the public) should be able to see. Of course, you can use “Import data” mode as well, but you’ll need to manually refresh your data sets. There is no explicit requirement that your end users be customers of Azure Active Directory (Azure AD). 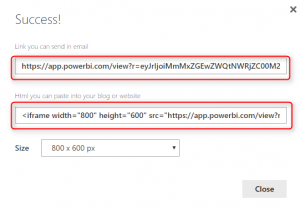 Instead, your application expresses to Microsoft Power BI Embedded authorization to render a Power BI report by using Application Authentication Tokens (App Tokens). In a previous post, I explain how to use Row level security (RLS). RSL can be used to restrict user access to particular data within a report or dataset, this allows for multiple users to use the same report while all seeing different data. 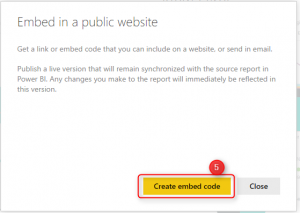 Power BI Embedded now supports datasets configured with RLS. Like any other service in Azure, resources for Power BI Embedded are provisioned through the Azure ARM APIs. In this case, the resource that you provision is a Power BI Workspace Collection. Step 2: Configuring Azure Power BI and uploading/deploying the Power BI Desktop file. 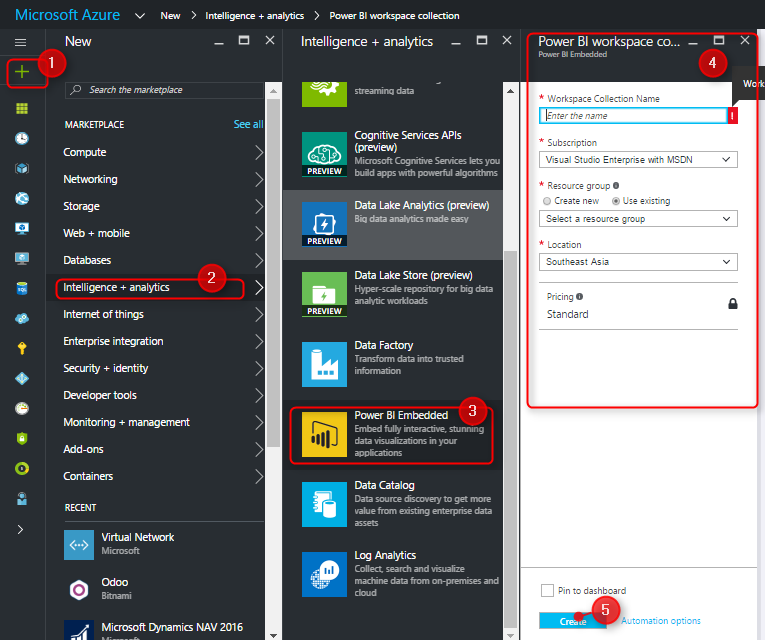 First, create the Azure Power BI Embedded service and Workspace Collection. Note: Take note of the Workspace Collection name , Resource Group and Access Key. Now that we have created the Power BI Embedded service with Workspace Collection. Next, we have to create a Workspace and upload the Power BI Desktop file to this Workspace. For this, we need a console app which will connect to the Azure Power BI service and upload the file. After doing this we will have a new Workspace in our Workspace collection. Next we upload the .pbix file, press 6, and follow the steps in console app. Finally, we have created/configured the Power BI Embedded environment in Azure. Step 3: Calling the deployed report. The last step will be to consume the Power BI reports from Azure. In our sample app we configure the web.config, in the EmbedSample web application and provide the Access key, Workspace Collection and Workspace id. You can get all these from the Azure Power BI Embedded service. Some additional features you can add is RSL and refreshable report using an azure SQL Database as source for your Power BI report. This is a fantastic way to consolidate value into one place via a custom app and thereby negating the need to visit the Power BI service to view your reports. Feel free to contact me if you would like to discuss how best to embed Power BI reports into your app environment. Good article. Now I have a comment about Power BI Embedded. I fully understand Microsoft decision regarding Premium in large enterprises context. Though as a developers, our job is not limited to coding, producing nice charts, but also bringing new people [including SME] to invest in a solution we strongly trusted and believed in. even at 625$ US / month, the EM1 entry point seems a bit too high to swallow for a considerable amount of SME people.